21211 (b) No person may place or park any bicycle, vehicle, or any other object upon any bikeway or bicycle path or trail, as specified in subdivision (a), which impedes or blocks the normal and reasonable movement of any bicyclist unless the placement or parking is necessary for safe operation or is otherwise in compliance with the law. Some people misunderstand where to place their trash cans, but most people know and don’t care – I’ve had extensive conversations with many such people – they don’t think that my right to the bike lane supersedes their right to put their trash can wherever they damned well please. 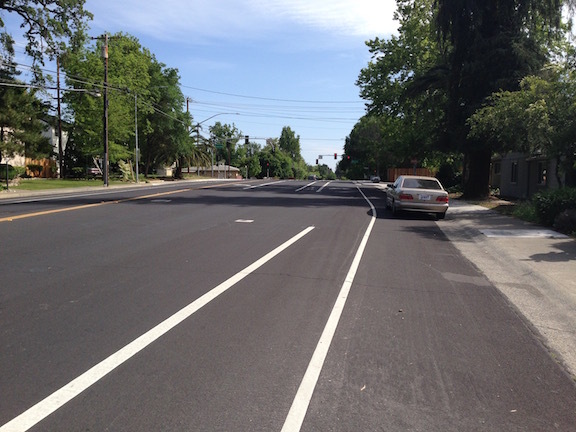 The photo at right is on Tupelo Drive in Citrus Heights, trash cans placed directly in a marked bike lane. Notice that it would have been easy to place them in the parking “lane” instead, but the residents chose not to. This is not just a Citrus Heights problem, this photo could as well be any street anywhere in the region. The photo below shows Garfield Ave southbound approaching Marconi Ave, in the Carmichael community of Sacramento County. This roadway was repaved within the last year, and this is the bicycle facility that was painted by the county. The bike lane veers to the right and then ends, running into the dedicated right hand turn lane, and another bike lane continues to the left of the right hand turn lane. These pavement marking clearly give priority to motor vehicles making a right hand turn, and ask bicyclists to yield to those vehicles, as second-class users of the roadways. There has been a discussion on the Association for Pedestrian and Bicyclist Professionals (APBP) listserv for the last two weeks on what to do with an outside lane of 14 feet (without on-street parking), particularly when there is a seam between the asphalt pavement and the gutter pan. 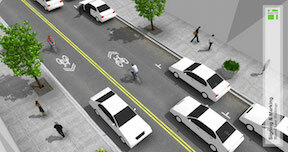 Several people encouraged the use of narrow, substandard bike lanes in an effort to get something on the street, rather than using sharrows in the wide lane, or just leaving the lane unmarked. I believe we need to be very careful to not create “bike lanes at any cost,” and to carefully consider the actual roadway conditions before specifying anything that does not meet or exceed standards. 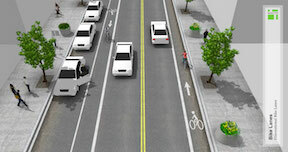 The diagrams below are from the NACTO Urban Bikeway Design Guide. The first shows a high quality bike lane adjacent to a curb; the second one shows sharrows rather than a bike lane where there is not sufficient roadways width.